Three years ago, we met Walter Herbst, the designer of the famous pocket fisherman. That simple device inspired us to start our monthly tradition of spotlighting Ahh-Mazing “AHA!” Discoveries. This month we revert back to the first “AHA!” with another simple pocket-size device modified by AquaNew’s CEO and Inventor, Rob Gourley. It is a new accessory for the 10-cell WIT Machine used in health clinics as part of their protocols to revive visual clarity. Rob purchased swim googles (Speedo’s best fit) from a local swimsuit shop. 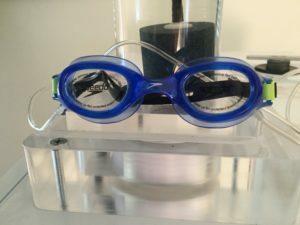 He added barbs and flanges to attach PET-1 latex-free plastic tubing to each side of the goggles that transport the Dioxytetrahydride Gas , giving more direct exposure of the Gas to the patients’ eyes … not unlike a nasal cannula but used for the eyes. We are receiving rave reviews on how refreshing the eyes feel. “At 75, I have cataracts in both eyes. I am also on medication intended to prevent further vision loss by lowering intraocular pressure on my optic nerves. Due to these conditions, I am no stranger in blurred vision. In fact, I frequently experience difficulty in reading unfamiliar street signs or license plates of cars farther away than the one immediately ahead of me. My condition of occasional elevated glucose has also contributed to poor night vision and I avoid driving at night. Between July and October of last year, I had a prolonged episode of blurred vision during which I saw three ophthalmologists and an optometrist. After experimenting with several eye drops, I was eventually treated for eye inflammation. Last Saturday, after noticing more blurred vision than normal during a 15-mile trip from Pembroke Pines to Plantation, FL., I decided to avoid the many intersections by using I-95 to get to my next stop. I started out at about 5:00 pm.” In the complete written testimonial (then click on the fourth box located on the right column), he describes difficulties of getting home as well as driving again on Sunday. 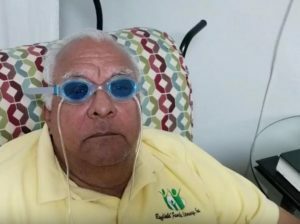 He continues … “My day and night vision did not improve on Monday or Tuesday, until on Tuesday evening I received a 30-minute ionized water treatment on my eyes from Dr. Campbell, using the goggles he provided. Immediately following this treatment, I got into my car and headed for home in the dark, expecting the usual difficulties. This time all of the street signs, traffic signs and license plates were very clear, and everything looked crisper than before. I had no difficulty driving home at night, and the images and captions on my TV were sharp and crystal clear. “I am 51 years old, and was born with a hereditary condition that affects the oxygen level in my red blood platelets. Recently in the last 2 years, I started having problems with my eyes. I have virtuous hemorrhaging in the rear of my eye which means it is basically bleeding. The sickle-shape of cells cut the veins of my eyes, and cause bleeding. I was able to see floaters in my eye which was a warning sign that something was about to happen. 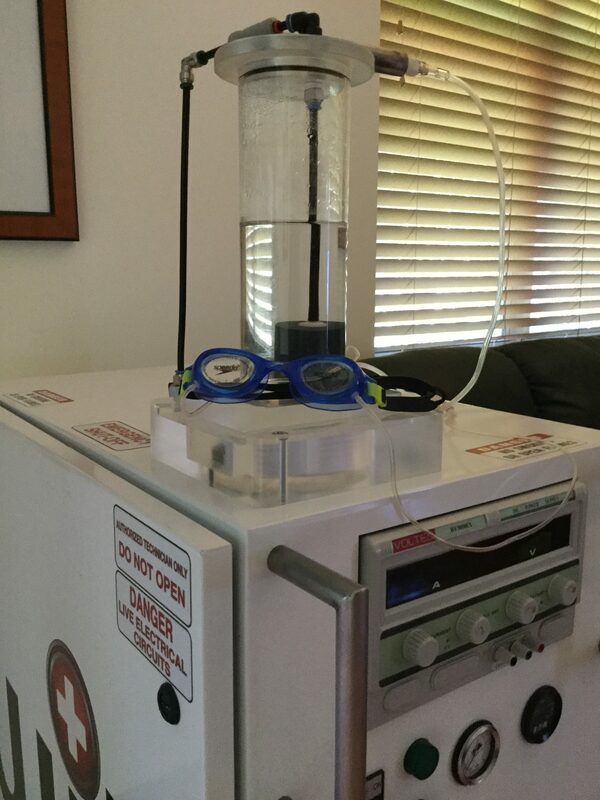 I tried the water ionization water treatment machine. The first treatment, I did not notice much difference in my eyes. Dr. Campbell assured me to continue to do the treatments. I finished the 2nd treatment, and there was an improvement in my vision. The floaters were smaller, and had started to break up. I went to my eye specialist after the 2nd treatment, and he did not see the need to inject me in the eye. On the 3rd treatment, I tried both the eye goggles, and the cannula together. The results were amazing. The floaters in my eyes were tiny, and the strands that looked like little hairs in my eyes were almost gone. As I type this, there is not anything blocking my vision. I will see my retina specialist again in one month, and I can’t wait to see what he says. Thank you, Owen, Adrienne and Dr. Campbell for sharing with the intent to help others.